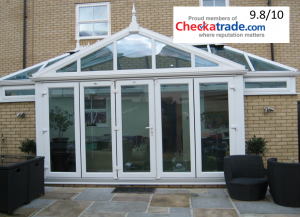 Sovereign Home Improvements is the leading installer of windows and doors in Essex. We supply and install all types of windows including casement windows, tilt and turn windows, bow windows, bay windows, sash windows, and more, and they can be made of UPVC, wood, or aluminium. Many people today opt for UPVC windows because they are less expensive than aluminium or wood, and they can be provided in a range of colours other than plain white. In fact, we offer them in rosewood, light oak, and the increasingly popular anthracite grey among several other choices. All of our windows come fitted with the 10-point police-approved locking system which is called Secured By Design. We use A+ energy rated glass in all our windows, whether double or triple glazed, and our warm edge spacer technology between the glass makes the glass further energy efficient and helps to keep down condensation. In addition, it helps to reduce external noise which is perfect if you live on a busy main road or around Southend or Stansted airport. Many of our customers are choosing tilt and turn windows. These open 90° into the room so that they let in the maximum amount of fresh air, but also tilt open at the top and can be locked into one of several opening positions. This means that you can have fresh air coming into the room even if it is raining outside. These windows will also save you the cost of the window cleaner calling every month because they open into the room, so you can clean the glass on the outside from the inside! 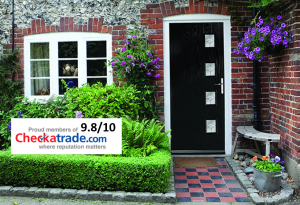 As far as doors go, many customers are replacing their front doors with composite doors. Our 48mm doors are 10% thicker than any competitor and therefore more secure, but we go a step further with the Ultion locking system. Around 900 homes are broken into every day in the UK and 85% of these are by snapping the lock which can be done with a couple of DIY tools. In fact, you can watch a video of a burglar breaking a normal lock in just 9 seconds on the Ultion website and then watch him trying to break the Ultion lock. We believe the Ultion lock is a great investment. Our composite doors come in a range of no less than 256 colours ranging from contemporary colours to beautiful woodgrain finishes.